Our children need to "learn by doing" and go beyond just learning theory. 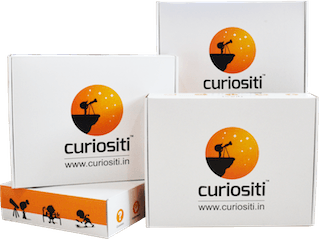 A team of teachers, educators, designers and technologists at Curiositi work to make this a reality. We ship to your doorstep, Syllabus Appropriate Activity Kits from Age 1 to Standard 10 covering Science & Maths. Every Activity Kit is intended to help your child explore a concept that he/she is expected to learn in that Standard and to learn better. Learn by doing. Connect with experiences from the past and build a better foundation. Copyright Curiositi Learning Solutions 2018.